"Air Machine" is only $13.00CAN plus shipping and taxes where applicable! Frank Van Bogaert with Erik Wollo "Air Machine"
A new collaboration from two very talented artists. "Air Machine" by Frank Van Bogaert and Erik Wollo is an excellent album that addresses environmental collapse through ten songs that follow a society on the brink of ruin as a result of failing technology. 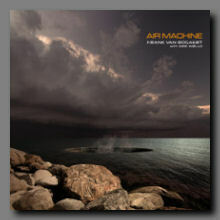 Using this concept as a basis around which the songs are built, "Air Machine" is an impressive release that simultaneously provokes thought in the listener, while also displaying the distinct talents of both Van Bogaert and Wollo. The first track, "Dead Planet", is surely that, a windy and barren soundscape that brings to mind the sound of deserts and abandoned cities. Out of the emptiness there's a slight sense of melody that quickly builds into a majestic theme of sorts, crisp synths paired with choral voices to create a lush swelling opus. It's all very dramatic, and very effective at setting the tone for the rest of the album. "Air Machine" is up next, offering a sense of hope and possibility, a crisp and clear piano line bringing to mind the chance of relief and natural elements. There's a theatrical feel to the proceedings, with dramatic Gilmour-esque guitar from Wollo playing throughout the latter half of the track, bringing to mind a certain Pink Floyd quality that I really enjoy. "Insomnia" opens with a light drone paired with brushed high hats, a more subtle atmospheric track that gradually opens up with the addition of a slowly developing synth melody. The track is aptly named, nicely capturing the sound of late nights spent sleepless with worry and angst. Minor melodies play at the edge of the soundfield, like fleeting thoughts that pass through one's head too quickly to focus on. As the track continues it becomes more focused, more defined, but still retaining that otherworldly quality that only happens on the edges of sleep. Very nicely done. "Hyperventilate" features a lovely choral swell that's nicely mirrored by a piano melody, a pumping synthline pushing the track along. Wollo's guitar plays a beautiful accompaniment here, a driving rock drum adding colour and flavor. Another really nicely executed dramatic moment. "All Has Stopped" is a mournful track with minimal instrumentation where a longing synthline and some beautiful guitar work blend together to create a haunting and lamenting piece of music. Perhaps my favorite track on the release, its a delicate piece that brings to mind cloudless blue skies as far as the eyes can see. "Breathe" opens with a sequenced synthline and building percussion. It has a nice flow, a well-executed swell. Vocals come in, accompanied by a heavier drum line and plucked melodic guitar that echoes an earlier theme from the disc. Repeating the line "Let us Breathe..." like a mantra, Van Bogaert's vocals offer a calming focus for the listener amidst an avalanche of percussion, eventually giving way to a lovely acoustic guitar closing. "Cold Steel" pairs a steady drone with a pulsing synthline that rotates through the soundfield. A short arpeggio rises and falls through the track, and a high pitched synth plays a slight melody. Despite its name, there's a real warmth to this track, a feeling of being enveloped in sound and music, surrounded by tones that dance around you. Beautiful. "Marbles (Memories of Childhood)" cleverly applies reversed tracks to the sound of bouncing balls and a slowly rotating synthline, evoking a sense of peace and nostalgia. A short but effective track that leads into the disc's closer, "Memories of Waves", which pairs the sound of waves underneath a dramatic piano melody that swells and falls like the tide. There's some beautiful playing here, and I commend Van Bogaert for his talent on the keys. On "Air Machine", Van Bogaert and Wollo have done a wonderful job of telling a story with broad strokes, leaving the listener to fill in the blanks and allowing them to share in the creation of scenarios and outcomes. And that's not always the easiest thing to do when faced with the idea of a concept album. "Air Machine" succeeds in ways that many similar efforts have failed, by leading the listener to a point and allowing them to continue on their own. Kudos to Van Bogaert and Wollo for addressing significant issues through a creative medium.